UPDATE: This house has sold. What sets our next house tour apart from our other house tours is that this one is for sale! 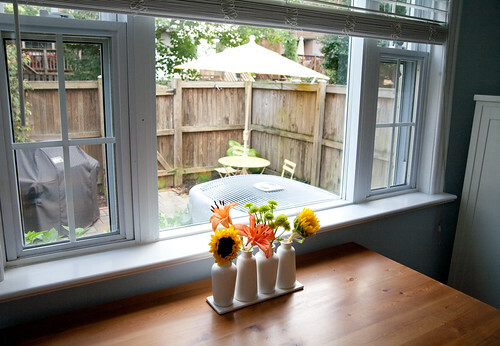 Yes, that’s right, you can buy this charming, light-filled, end-unit townhouse smack dab in the heart of Del Ray. 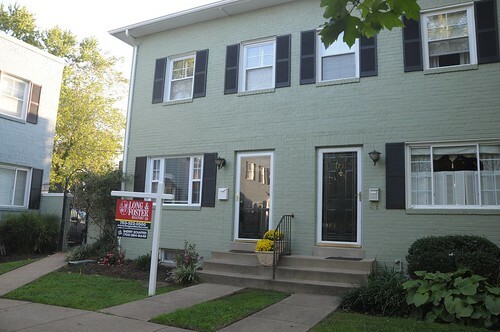 It went on the market yesterday and there will be an open house this weekend (Saturday AND Sunday — so stop by while you’re out and about for Art on the Avenue). 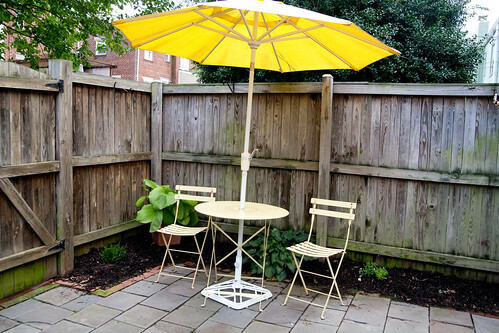 1733 N. Cliff St. is located in the Cliff Gardens townhouse community, known for its friendly, communal atmosphere and huge shared courtyard — it’ll be hard to find comparable open yard space in Del Ray. Don’t worry, the yard is maintained by the homeowners’ association so there’s no need to run out and get a mower. 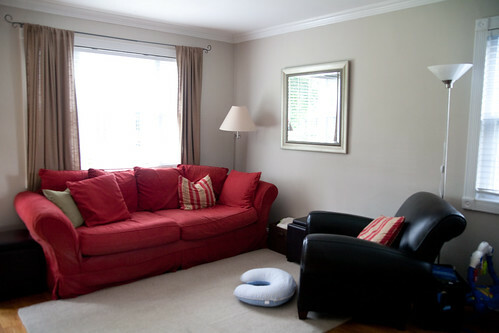 Instead, you’ll enjoy your weekends tossing a Frisbee, reading a book under a mature tree, or mingling with neighbors. But enough about the yard, let’s head inside. The living and dining area is bright and open and boasts neutral paint, white wooden blinds, crown molding, and gorgeous refinished 1950s wood floors. Unlike other units in Cliff Gardens, this one has a unique layout. 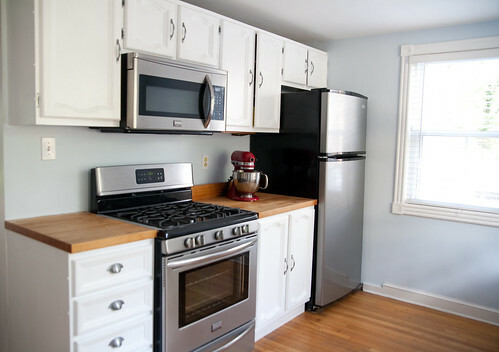 The previous owner enlarged the galley kitchen into the traditional dining area, creating a large eat-in kitchen. 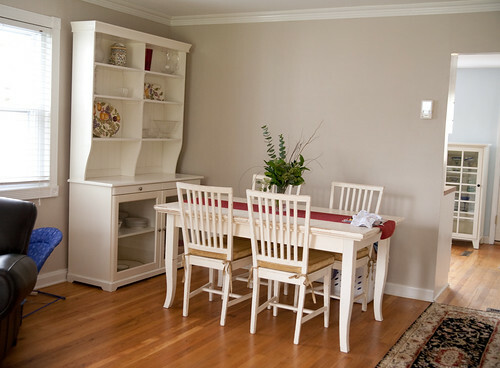 If you like a separate dining area, you are still in luck — there is plenty of space in the front room for a dedicated dining area. 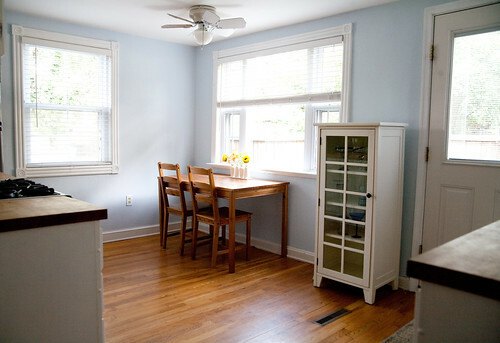 An eat-in kitchen in a Del Ray townhouse is almost unheard of and I’m definitely jealous —- you could even use the table by the window as a home office. The wood floors continue from the living area. 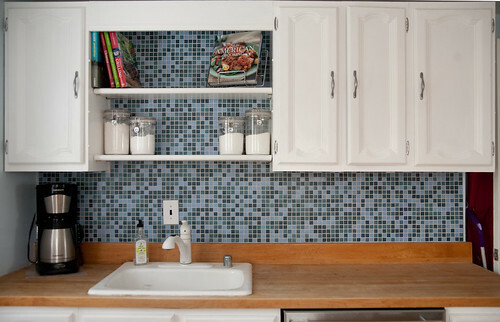 White cabinets, butcher block counters, stainless steel appliances, two windows, and a fabulous blue and green tile back splash make this room simply a delight. The back door leads to a slate patio with ample room for a table and grill. Don’t be scared of the air conditioner — it’s big, but it’s a new, energy-efficient model and oh so quiet. Yes, you can entertain outside and not compete with a loud machine. The fenced-in patio is surrounded on all sides by a border ready for your fall flowers and shrubs. Another outside detail you will notice at the open house is how they widened the steps from the kitchen to the patio by replacing the original iron steps with Trex. Upstairs, the bathroom has been completely renovated. When the owners remodeled, they added an exhaust fan. So go ahead and take a steaming hot shower and don’t worry about the consequences. 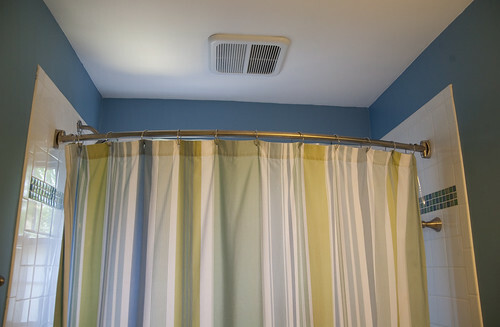 The tile is classy and modern — with a blue tile accent strip in the shower. 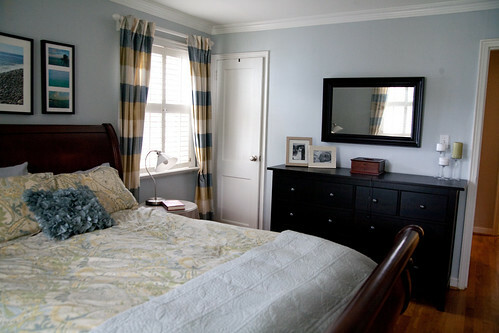 The two bedrooms are spacious, well-painted, and finished with a classic crown molding. I’m ready to take a nap in that large, inviting queen-sized bed. And finally for the basement. With a nook for one of the largest TVs I’ve ever seen, plus space two couches, you and your guests will be comfy cozy watching your favorite shows — who’s ready for some football? 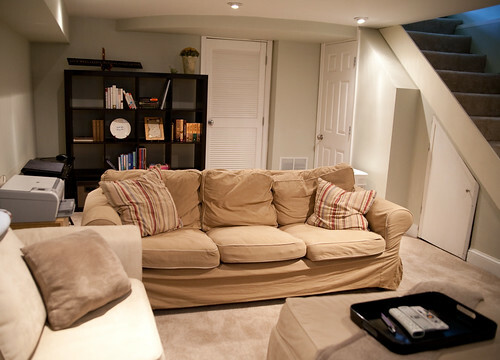 The basement also features brand new carpet, a half bath tucked under the stairs, and a large laundry and storage area. I love that little door under the stairs for storage — very smart way to make the most out of every nook and cranny. 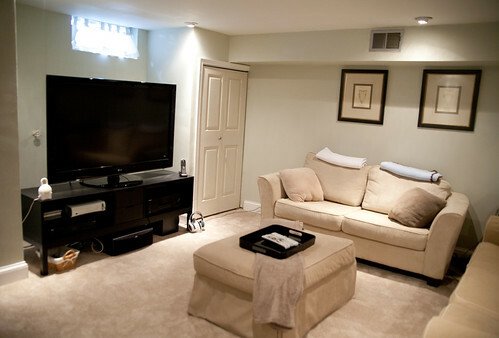 There are also storage closets on either side of the TV. Well-maintained, light-filled, modern updates, careful attention to detail — what’s not to love?